Foreo has most certainly managed to design a unique looking toothbrush. But, is the ISSA model as effective in action as it is eye-catching? Only one way to find out! Put it to the test! The company Foreo is known for their simple and yet elegant products. They use a wide range of colors. 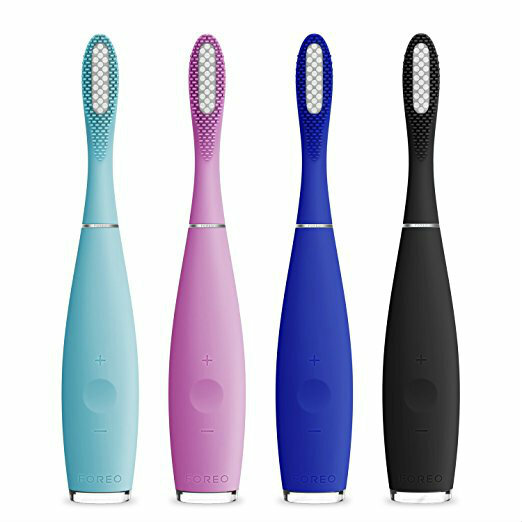 The Foreo ISSA has been produced to compete with the other rechargeable electric toothbrushes on the market and the overall design looks amazing. The bristles used with this brush are not the standard nylon bristles. Instead, Foreo has replaced them with antibacterial silicone bristles which help to gently remove the plaque from your teeth. Taking a closer look at everything once it is out of the box, the instruction leaflet is in a very small font which may be difficult to read. Especially if your eyesight is not 20/20. The warranty which is supplied with this toothbrush is 2 years with a 10-year quality guarantee. We are not really sure what the 10-year quality guarantees. Don’t forget, there are cars that come with a 10 year bumper to bumper warranty. And, once you get into a car accident, you realize that the warranty does not cover much if anything. Foreo could have spent a bit more time explaining this guarantee. Otherwise, it seems to be a good marketing move that is set to place a lot of faith in Foreo’s product. Quick charge time and ability to retain charge. Built-in timer to keep track of brushing time. Antibacterial silicone bristles only require changing once a year. Large brush head if you have a small jaw. Silicone bristles don’t clean as effectively as regular bristles. The Foreo comes with a neat little pouch. At first, it appears to be leather. But, it is not. It is made of leatherette and it does not seem to be very high quality. Nevertheless, it is white and looks quite elegant. Including a USB charger is great. There are still manufacturers out there (Oral-B) that are failing to adjust to new technology. Charging your toothbrush from your laptop is the new standard! However, the USB cord is very short. We measured it to be around 18 inches, which is not enough to get the brush to charge at a location of your particular choice. 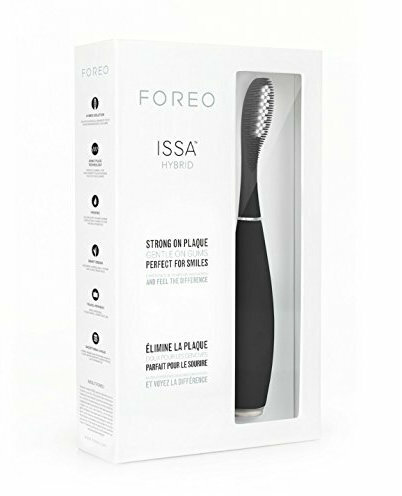 Foreo are known to have a minimalist style when it comes to their products and looking at the handle you can tell that the ISSA is no different. It is currently available in 4 colors which are: Cobalt Blue, Cool Black, Lavender, and mint. The whole handle has been made with an easy grip silicone which helps when you are giving your teeth a good brushing. When you first look over the handle it can be difficult to see that it does actually contain 3 buttons. One is in the center which is pressed in and the other is a plus and minus. The center button is the power button and the plus and minus at either side are to increase or decrease the motor’s speed. There are 8 different speed settings to choose from. This is quite unique, as most electric toothbrushes come with 5 or 6. Travel lock helps to prevent the toothbrush coming on whilst it is in your bag. This will also prevent any problems you may encounter with airport security. The last thing you want at the US border is a vibrating bag! Turning over the handle reveals a very plain back with only the charging port. It is well hidden by a small tab which when lifted reveals the port to charge the battery. Looking towards the top of the handle you will see that there is a metal prong which is where the toothbrush head sits. It is as simple as sliding on the head and clicking it into place when it comes to removing you just simply give a light pull and it will come off easily. Two options are available for the ISSA Brush head. 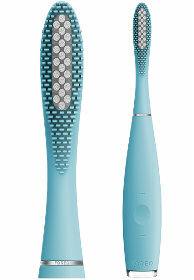 First, the standard brush head which uses non-nylon bristles but instead is equipped with antibacterial silicone ones. The length of the bristles and their positioning is quite interesting. They are very short near the beginning of the brush head, and slowly getting longer towards the end. 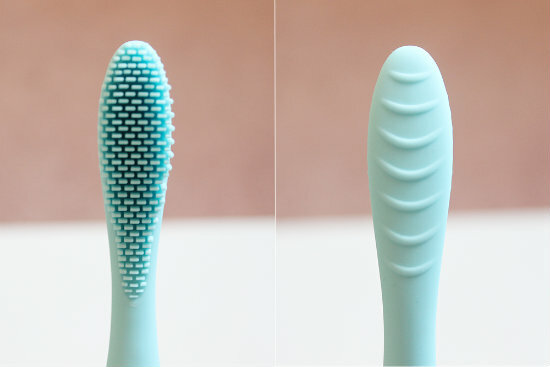 The silicone bristles are also quite thicker when compared to regular ones used by other brands. The second brush head option available is the hybrid. This adapts both the nylon bristles with the silicone which helps to remove a high amount of plaque build-up. The regular ISSA Brush head which comes as standard when you order the toothbrush has a slight curve and the bristles are varied in length to follow the curve. We found that either brush-head is not very suitable for people with braces. The heads are too big, and the bristles are too soft to effectively clean between the metal frames. The great thing about this brush head is that it only needs to be replaced once a year. Or so the manufacturer claims. We were not able to test the brush for a year, because that would be unrealistic. So, what happens to all the bacteria that builds up for a year? This is a fair question. So, we asked Foreo. They answered that their bristles are capable of withstanding bacteria because they are made of silicone. The company claims that the bristles they use carry 10,000 times fewer bacteria than normal brush heads. We can honestly not testify for or against this claim. However, not changing your brush head for a year is simply not good oral hygiene. We do not replace brushes just because of the bacteria that they have collected. We also replace the brush because bristles become much softer, and therefore, not as effective after time. The overall size of this toothbrush is small. So, depending on the size of your hands, it can be either very comfortable or a little slippery. Foreo mentions on their site to avoid any toothpaste which contains bleach as this will cause both the head and the handle to become stained. We would advise you to avoid toothpastes that use bleach in general. A lot of people with sensitive teeth and gums have reported that the silicon bristles make their brushing experience better. We do concur that even at the highest settings, this brush feels a little softer. This is good, especially for people with receding gums. However, the downside is that the brush is not as effective for cleaning between the teeth. The soft silicone bristles find it very challenging, if not impossible, to get between moderately tight teeth spaced. This ends up leaving quite a bit of plaque in places where there should be none after brushing. So, while the brush leaves your teeth feeling good after the first use, it is not as effective as other models out there. I had to replace the head of my brush after 5 months because the bristles were breaking off and the charging unit will not take a charge after 9 months of use. Waste of money!! !